to have conjugal visits with his wife. 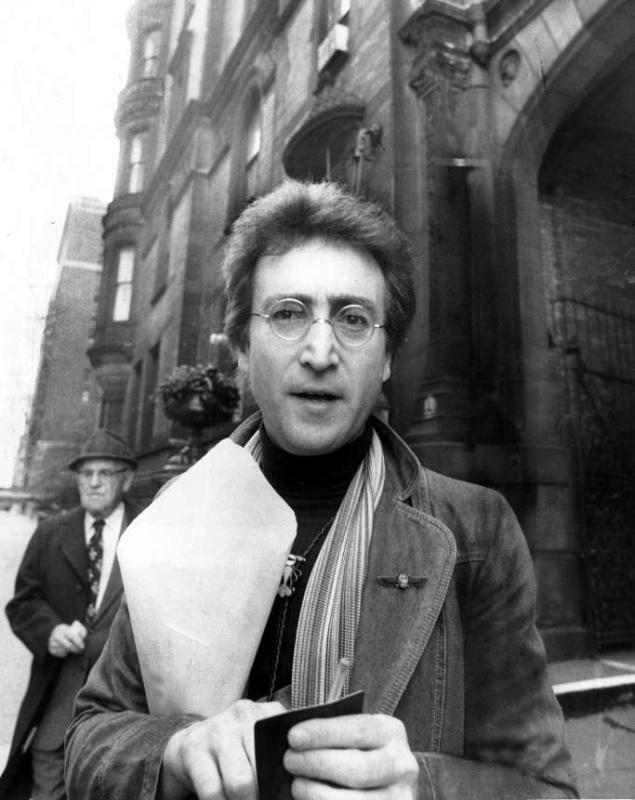 John Lennon's killer gets seventh shot at parole later this week. 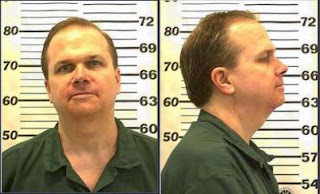 If John Lennon’s killer is denied parole at an upcoming hearing, he’ll still have one thing going for him — he has once again been permitted to have conjugal visits with his wife. 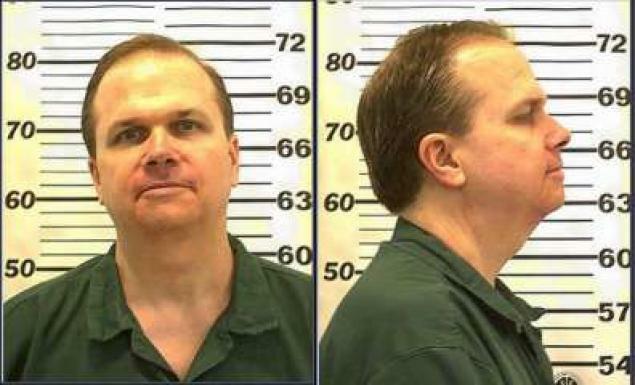 Mark David Chapman, whose seventh shot at parole is scheduled for this week, was reapproved Monday for conjugal visits, the Daily News has learned. Chapman had participated in the so-called “family reunion” program when he was an inmate at Attica Correctional Facility, the supermax pen in the upstate town by the same name. But he had to reapply after being transferred in May to Wende state prison in Genesee County. “He followed the standard procedures and protocols in our system, and his request for participation was approved,” said state prison system spokesman Peter Cutler. Chapman and wife Gloria Hiroko Chapman will be allowed to spend up to 48 hours in a trailer on prison grounds; his stepfather will also be able to visit to say hello. The trailer is free of prison guards and cameras; it has a kitchenette, a living room and at least two bedrooms. Submitted by Starship. Thanks Starship!! I was born in october of 63 so i was too young to remember the JFK assassination. The Lennon murder and 9-11 were the biggest events that i recall in my lifetime,not to downplay 9-11 but the JL murder really hit home because it was like a member of my family was killed. Its so hard to believe that it was 32 years ago..I can remember hearing the news like it was yesterday. My thought is they should release MDC and let nature take its course. I don't think he'd last too long on the outside. The death of John Lennon stung hard. I fervently dislike this Chapman guy... always have. And such an ugly motherf#cker, at that. How any woman could possibly stay married to this freak, for all these years, boggles my mind. I would hope, that most women would rather eat glass. Chapman HAS to rate high, as one of the most hated criminals still alive. He's definitely, at the top of my list. I think Chapman would likely be one of the most readily murdered parolees... even topping Manson's chances, by a landslide. This guy, would definitely have to go into some type of "protection program". I wonder if the British would voice disapproval, if we ever released this jerk? Women who marry jailbirds are losers. Like the Kennedy assassination and 9-11, I can remember the exact moment where I was when I heard that John Lennon had been shot and killed. It was a cold December night and I was stopped at a red light at sixth and asbury in a very empty Ocean City NJ. The town had Christmas lights lit along the downtown area. The radio announcer gave the grim news and I remember I just drove around for a long while, for some reason I didn't want to go anywhere, or see anyone. 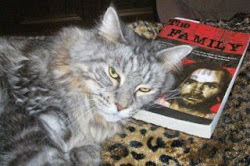 Thanx for the post, I seen that Chapman was coming up for parole. I think it said that "the decision will be released to the public on Friday". That could be an indication that he might get parole but not necessarily. If they weren't going to give him parole, they wouldn't have to hide it from the public. They made hide all parole hearing info from the public simply as a matter of policy though. I was just watching Chapter 27, and Mark Chapman makes the comment that Roman Polanski filmed Rosemary's Baby in the building where John lives, and Roman's wife was killed by the Manson Family because of Helter Skelter, written by John Lennon. 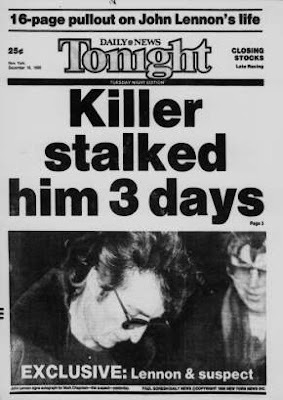 Was that the reason he killed Lennon...because of Helter Skelter? Or was that just made up for the movie. I think The book is really hard to find but your local library system might have a copy. Thanks Matt. Interesting. I didn't realize that anyone had any other theories on why Chapman killed Lennon. I know practically nothing about Chapman. In the movie he was portrayed as having a love/hate relationship regarding Lennon, along with a duo personality. It maintains that Chapman was actually arguing with himself about shooting Lennon right before the shooting. Of course, at the end of the movie it says he's now "born again". Sound familiar? That link is wrong try this. Thanks Matt. I don't really think the CIA would conspire to kill Lennon. Doesn't make a whole lot of sense. Like the article said, he wasn't a threat to capitalism. Instead, I think at the end of his life, he was enjoying it. Chapman was denied parole again. In the long run, and in the short run as well, people that are nobodies, unloved and unrecognized, which is a sizeable portion of the human race by the way......will with a single act attempt to link their name to history by bringing about the demise of someone famous. Tom....well said....that's why he's not getting out. These creeps that commit unthinkable crimes go to prison, and during the years, they find some dweeb to marry them, then they get "borned-again" and try to get out. Doris Tate worked long and hard for victims' rights, and gave Yoko the chance to go to Chapman's hearings and vote no. Born again Christianity is actually a very useful social utility. It brings creeps, miscreants, losers and sociopaths up to the moral standard that most of us have inately. If I were serving a life sentence in a state prison, you can bet your sweet Jesus I'd be reading the bible every day and every night. David Berkowitz, son of sam, is exhibit A. Well I kinda think Tex, Sadie & Bruce are more like Exhibit "A". HA HA. And they are. But try looking at their point of view. You're locked up in a tiny cell, bad food, lots of negros(not that there is anything wrong with that), what are you going to do to make your situation more tolerable? Human Beings are at their most fascinating, when it is time to survive. I wonder if the Aurora shooter will get "born again" some day. What are the odds? I guess we should look at our prison system as a Brother Love Traveling Salvation Show. LOL. A couple of inaccuracies here, Katie. Polanski wasn't granted access to film inside the Dakota for Rosemary's Baby. Only exterior shots (& the courtyard, I think). In the excellent film "The Killing Of John Lennon" an aerial shot from "Rosemary's Baby" of Rosemary & hubby entering the Dakota is utilized at one point. And Lennon didn't write HS, it was McCartney. I recall reading somewhere that Manson also thought that Lennon (the seer of the band) wrote it, and was disappointed to learn it was the more lightweight Macca. The original take Of HS was a ponderous, plodding 30 minute yawnfest. On The Beatles Anthology 3 there's a 4 minute segment of a similar slow 12 minute take. And yeah, I'm a massive Fab Four fan. And a big big fan of Todd Rundgren, who was Chapman's favourite. Rundgren was also said to be a potential target by MC on his (bad) trip to NYC. I didn't know that Polanski didn't get access to the Dakota. I always thought that the movie was shot in the building. I've read comments that Lennon made about Helter Skelter, something along the lines about what a bore it was. I think by the time they were through recording and re-recording that song they were pretty much sick of it. LOL. I didn't know that Rundgren was a target too. I haven't really read much on Chapman. I love Todd Rundgren and Helter Skelter is one of my favorite Beatles songs. He's still a creep. Everyone in the world has things on their dresser drawer, which may or may not lead to clues to the disturbances of their mind. Chapman was diagnosed as a paranoid schizophrenic. After he killed John Lennon, he was arraigned in New York City district court, then sent to Rikers Island prison. There he was put into a psych ward, and he was out of control, throwing feces at staff, etc. So they put him in a strait jacket and gave him the anti-psychotic drug Haloperidol via intramuscular injection in the buttocks. Why didn't they give Chapman an overdose of Haloperidol? That s**t would make a wacko like him into a permanent zombie. If it were an earlier period in time, Chapman would have been given a lobotomy and croaked.